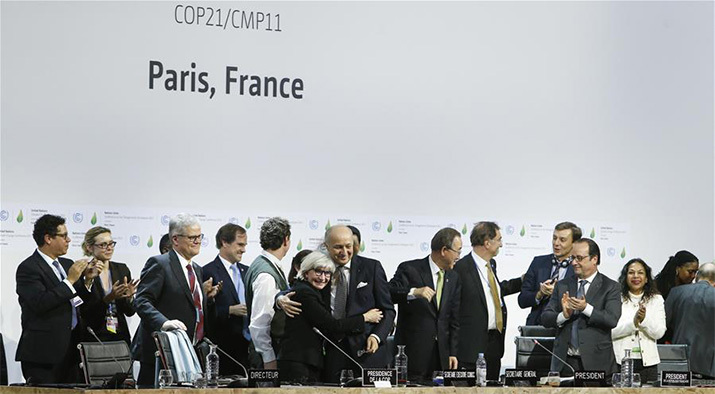 The landmark agreement on climate change signed in Paris on December 12 is "a new beginning in international cooperation" and is fair in splitting responsibility between developed and developing countries, according to a Chinese Foreign Ministry spokesperson. "We appreciate the efforts that all parties have made, especially host country France," Hong Lei said Sunday. "China has always promoted relative negotiations, and we will continue to work with the international community to deal with global climate change," Hong said. Adopted by the 196 Parties of the United Nations Framework Convention on Climate Change, the Paris Agreement sets a target of holding the global average rise in temperature below 2 degrees Celsius above pre-industrial levels, and preferably below 1.5 degrees. On the basis of common but differentiated responsibilities and respective capabilities, developed countries agreed to raise $100 billion a year by 2020 to help developing countries transform their economies. At the opening ceremony of the two-week Paris gathering, Chinese President Xi Jinping warned against a zero-sum game mentality in the negotiations. Following the adoption of the agreement, China's Special Representative on Climate Change Xie Zhenhua said, "The Paris Climate Conference is a crucial point in the global climate governance process. The outcome has a real bearing on human beings' undertakings in climate change and our future of sustainable development." "China will take international obligations commensurate with its own national condition, development stage and actual capacity," Xie vowed.